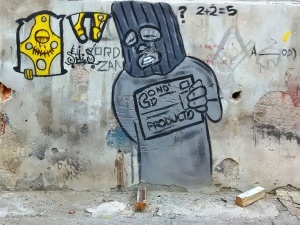 One of these graffiti drawings shows a hooded individual holding a ration booklet against his chest, condemning a failed economic system that is far from getting any better in the short run. The sketching is also accompanied by impossible math a la Orwell: 2+2=5. Maybe it’s a way of reminding us that in this country, even the most basic arithmetic does not add up because as Cubans say “la cuenta no da” (“it does not add up”). Maybe it’s a visual manifestation over what is forced to accepted as a daily reality. Reflecting in this manner is very dangerous in Cuba. Other graffiti drawings have also popped up in other major areas, making up authentic murals. On the Infanta road, some drawings had the audacity to portray Che Guevara, untouchable character, as more diabolic than holy, “warmed up” with water, the elixir of life. A patient observation requires some thought into these pictures converted into deliberate enigmas from their anonymous artists. Is it proper defense or a way of evading censorship in this armed entanglement of the last six revolutionary decades? Most people walk past without stopping to look at these graffiti drawings and maybe the reason for this is very simple: Eyes are blinded when the mind is absent. Despite this, the people that do look at these drawings have not stopped looking, ever since they first laid their eyes on them. They do not care about the surrounding rats and much less the walls that will inevitably fall over at any moment.